Please see our CHRISTIAN EVENTS page for details about our EASTER 2019 service times. 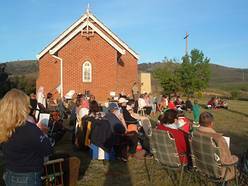 The congregation of St Paul's Cooma (the principal worship centre of our scattered Christian communities) meets for worship at 9am each Sunday in St Paul's Church, 136 Commissioner St.
A small congregation also meets each Wednesday at 9:30am. St John's is a church with a remarkable history. 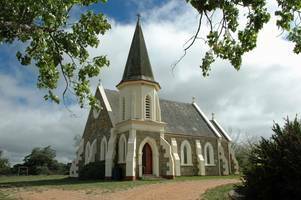 Initially built in what is now known as Old Adaminaby, this wonderful old church was dismantled and re-built some 8 kilometres away following the construction of Lake Eucumbene, which flooded the original township. In fact, the entire village was relocated to its present site to make way for the Snowy Hydro Electric Scheme. Worship is held on the first and third Sunday at 3pm during Winter, and 4pm during Daylight Saving. Services are held in our cosy hall adjacent to the church. But for major services such as Christmas and Easter, the church is our worship venue. We are small in number but dedicated in our worship, which is relaxed and somewhat informal. Our local contact is Deacon Edith Mayhew: Ph 6454 2274. St Bartholomew's, Dulcie Street, Bredbo - a Christian Place for the Community. Worship is held on the first Sunday of each month at 11.30am. The fellowship and worship is deep and sincere. Mid-week services also occur on the 2nd and 4th Tuesday of every month, 7:00pm at 2 Dulcie Street. 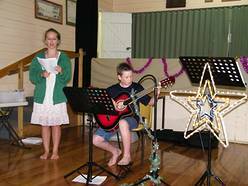 Carols Across the Village have been held since 2007 on the Sunday before Christmas Day. Venue is the grounds of St Bartholomew's. Worship is normally held on the fourth Sunday of the month, at 11:30am. (No service in January). St John's Church, MacLean St.
Worship is normally held on the second Sunday of the month, at 11:30am. (No service in January). St Peter's Church, Kirke St.
More traditional services are held on 3rd Sundays. On alternating months, we have Holy Communion on the 3rd Sunday (led by the minister) or Morning Prayer (led by a local lay person). There's no communion service in January. 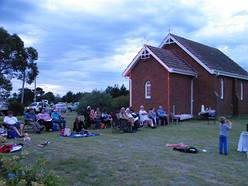 Built in 1845, Christ Church is the oldest Christian worship building on the Monaro. It is located on Church Rd, just beyond the outskirts of Cooma. With its accompanying pioneer cemetery, it is a historical landmark, and a testament to the labours of those who began gospel work in the region. Regular worship ceased when St Paul's Cooma was completed in 1871/72. Special services are held at Christ Church occasionally.